That I haven't thought of this before! 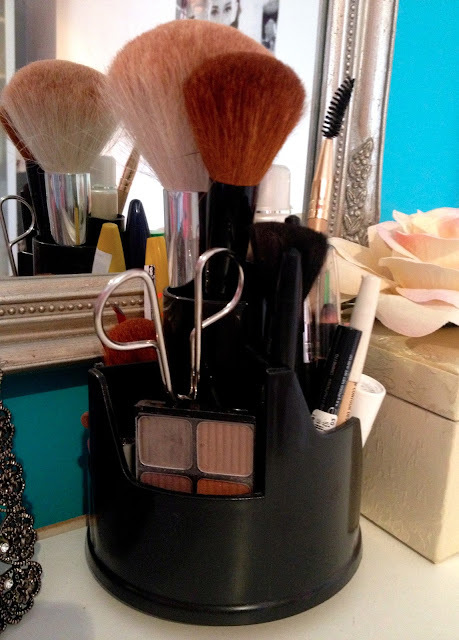 I was so tired of having to grab my make-up tools out of a toiletry bag. Until I saw someone posting a photo on Pinterest of make-up being storaged in an office accessories set! It's an easy way to organise your make-up, everything remains clean and no more waisting time searching for stuff in a dark, small bag. Since I'm a big fan of organizing it's the ideal item for me :)! It's divided into small compartments. The size of the office accessories set depends on how much tools you want to cram in it. This one is perfect of all the stuff I need daily and I bought it at Action for just a few euros. Everything that didn't fit in (like blushers and big color palettes) are in the box beside. Joan Holloway (4/4); "Well, hello Mr. Draper."